Alex is asked to help with an issue at the UK’s Wimbledon. Turns out someone was drugging players in attempt to match fix. Alex gets in the bad books of the Chinese Triad that organised it – and they try to kill while he is on holiday. Later, MI6 give him a new mission and he is to work in collaboration with two CIA agents. They head to Skeleton Key – an island off Cuba – to investigate a man named Sarov who is trying to bring communism back to Russia. The two CIA agents are killed in action, and Alex is kidnapped by Sarov. He is flown to Russia where manages to stop the attack before anything gets blown up. Afterwards, he goes on holiday with his friend’s family to relax. 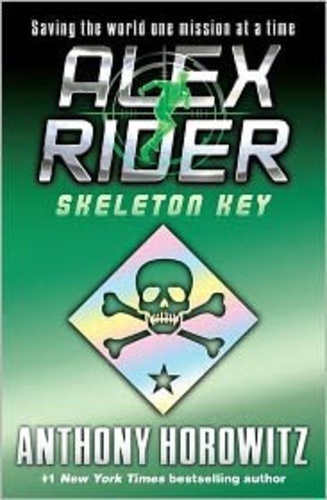 Opens with two men named Marc and Carlo, flying to meet General Alexei Sarov in Cayo Esqueleto – translated as “Skeleton Key”. They’re there to exchange a kilogram of uranium for money. Sarov reveals he needs more. The two men threaten to call American intelligence if they don’t get money within three days. As punishment for threatening him, Sarov turns the runway lights off when the men go to leave. Instead, he makes the lights lead a path into the nearby swap. Sarov watches as, trapped in the swamp, the men are devoured by crocodiles. Intense beginning, eh? Back in London, it’s revealed Alex did survive the fight with Grief’s clone and is visited by John Crawley at his school. Crawley gives Alex tickets to the Wimbledon. It isn’t that easy though. Alex is asked to go undercover as a ball boy, after there was a suspicious break-in at the arena. He befriends a girl named Sabina Pleasure during his training. Alex notices a suspicious-looking Chinese guard during the tournament and investigates him. The guard lures Alex into a secluded area and tries to kill him. Alex survives the attack and learns the guard was part of the Chinese triad “Big Circle”. He was attempting to match fix by drugging particular player’s water – making them not play well. Another triad member tries to kill Alex when he goes on vacation to Cornwall with Sabina. They try to run him over with a jet ski while he is surfing. He almost drowns but Sabina save shim. Alex gets his next mission. He is to go with two American CIA agents, Tom Turner and Belinda Troy, to Skeleton Key to investigate General Sarov. The CIA are worried about Sarov’s meeting with the Russian president, Boris Kiriyenko. Turner and Troy go undercover as Alex’s parents. Turner and Troy aren’t happy about having a “child” with them, they think Alex is going to get in the way of their mission. When they arrive at Skeleton Key, Alex discovers that the real reason for their investigation is to check for a nuclear bomb on the island. The Salesman had sold uranium to Sarov, and that’s why they suspect him. Turner and Troy plan on breaking into Casa de Oro – Sarov’s residence – to investigate further. They discovered an old mine cave in the ocean that has a tunnel going up into Casa de Oro, and plan to go in that way. They allow Alex to come out on the boat with them, and the scuba dive to the cave. They do not return. Alex grows suspicious and decides to dive by himself. He has a close encounter with a shark. He discovers that the cave is triggered with traps. Turner and Troy are dead – they were impaled on the metal spikes. Alex returns to the surface and discovers the boat driver dead. Conrad drugs and kidnaps Alex from the boat. He drives him to a sugar factory. When Alex comes to he realises he is tied to a conveyor belt and Conrad begins to interrogate him. Alex lies but Conrad already knows the truth. He adjusts Alex’s straps and puts him near a crusher. Despite Alex telling him the truth – to save himself from a grisly death – Conrad decides to kill him. General Sarov comes in and stops the machine from killing Alex, however. Alex passes out from the stress. Alex wakes up in Casa de Oro, he demands to know what is happening. Sarov promises to tell him the next day. Sarov reveals some of his past to Alex – telling him about his son, Vladimir, who was killed on duty in the Afghan War. Sarov bizarrely also reveals to Alex that he wishes to adopt him – he is so much like Vladimir. Alex is moved to the slave house. Alex attempts an escape. He hides in the boot of a limousine after a lunch with Sarov and the Russian president. He is caught by Sarov, a machine in the car detected his heart rate. Sarov punishes Alex with mental torture. Conrad holds a gun at Alex. Sarov holds in front of Alex, so he can hear his heartbeat. Conrad holds the gun against Alex’s chest. Sarov talks the whole time, about how Conrad will kill Alex and he will be able to hear it stop. Conrad puts pressure on the trigger, and Sarvov turns off the machine – creating the illusion Alex has been shot. Conrad then takes Alex make to the slave house. At dinner that evening, Sarov drugs the Russian president and all his other guests enough to knock them out. He transports them to the slave house and has his nuclear bomb transported onto his island. Sarov flies Alex and Conrad to Russia. As he does, Sarov tells Alex of his evil plan: they are heading to Murmansk, where they is a shipyard full of old nuclear submarines. He wants to drop the nuclear bomb there and cause a massive explosion. Russia will be blamed for neglecting to dispose of old nuclear weapons. The current Russian president – who Sarov blames for ruining his mother country – will be blamed. Footage of the president from his trip to Casa de Oro will be manipulated and “leaked” onto the internet, to really hammer in an image of his supposed stupidity and irresponsibility. This will force the president to step down, and then Sarov will kill him – faking heart failure. Russia will go back to communism. Sarov will take over. When the plane makes a stopover in Edinburgh, Alex uses a stun grenade to escape the plane, temporarily incapacitating Sarov and Conrad. Alex runs into the terminal and tries to all the police. A guard called George Pescott stops him. Alex tries to convince George of his story’s truth, but Sarov captures him again and Conrad kills George. They continue their flight. At Murmansk, Conrad plants the bomb on a submarine by using a magnetic crane. One of Sarov’s men handcuffs Alex to a handrail by the submarines. Sarov wishes Alex goodbye. Alex sets himself free by using one of Smithers’ gadgets. Conrad notices and leaves the crane to approach Alex. They fight. The Russian army arrives and starts fighting Sarov’s men. Conrad overpowers Alex and attempts to strange him. Conrad, however – who has numerous metal implants in his body – is caught in the force of the magnetic crane. Conrad’s back is crushed as he pulled up by the crane. Alex takes over the crane and drops Conrad into the sea. Alex then grabs the nuclear bomb and removes the detonation card. Sarov appears and tells him to put it back in the bomb. Alex tells Sarov that he would rather die than be Sarov’s son. Sarov commits suicide. It’s revealed that an officer heard Alex’s pleas through George’s radio. He didn’t believe Alex until he heard George’s death. He immediately notified MI6, who notified Russia. Alex becomes depressed after this mission. Sabina approaches Alex, however, and offers him a holiday in France with her family for a couple of weeks. This cheers Alex up. MI6 = the spy agency Alex works for.